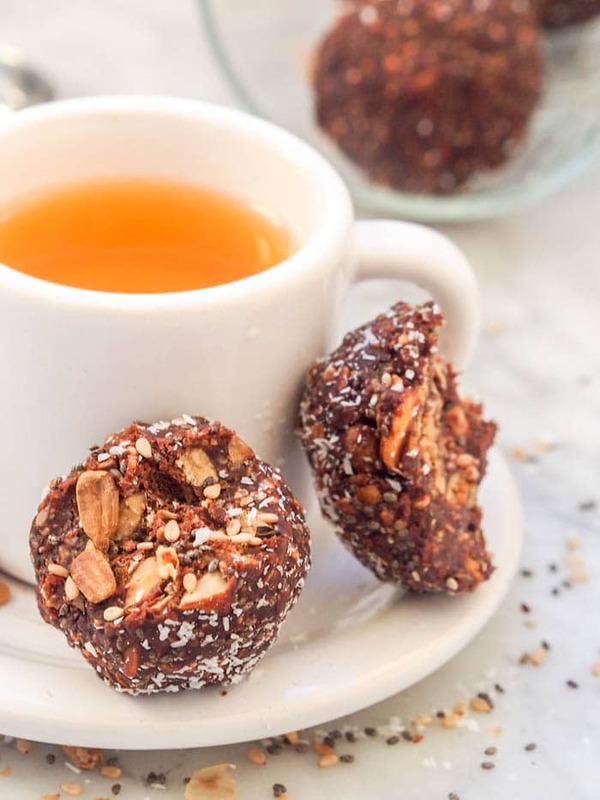 Vegan Chocolate Balls with Shredded Coconut make for a perfect guilt free 5 minute summer dessert. No baking required or clean up required – made in one pot. 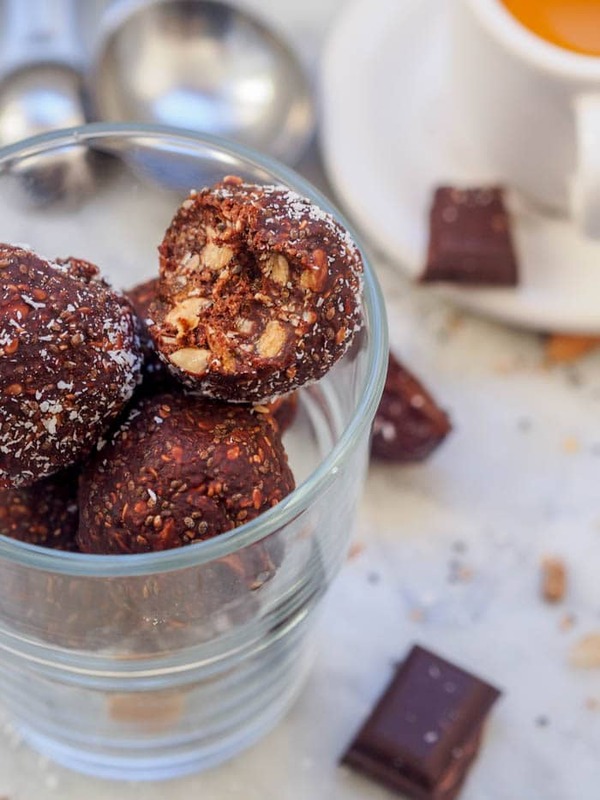 A handful of superfood ingredients including chia seeds, sunflower seeds and sesame seeds, along with dark chocolate, dates and peanuts make these vegan chocolate balls a perfect healthy sweet treat. Refined sugar free and gluten-free. Chile and Argentina had a lot of tempting desserts (those guys are obsessed with dulce de leche, especially when sandwiched between two cookies), everywhere. As seems to be the case in Portugal as well. Not a big problem for me, but definitely a big problem for D. I’m only tempted by savory food, and find myself needing to glance at every single menu I walk by, just to know, what’s on there. Doesn’t matter if I just stuffed myself on lunch or dinner, if there’s a menu on display within eye sight, I’ve got to take a look. Desserts just don’t have that effect on me. While I am, like everyone else, drawn to gorgeous display cases of colorful pastries, indulgent looking chocolate truffles and fluffy gelato towers, for me this is just for the aesthetics. Dessert always is made to look pretty. And I respect that. I get to look at adorable pastries and I’m good. For the majority of people I have a feeling that’s not the case. D walks by a dessert display and instantly wants to buy everything. If not for one tiny little problem. Sugar and sweets aren’t exactly healthy or good for us. Probably not the food category you’re trying to load up on. So that’s where I come in. To make sure that D doesn’t over do it on the bakery sweets, I came in to save the day with these vegan chocolate balls. These are the perfect healthy feel good dessert. 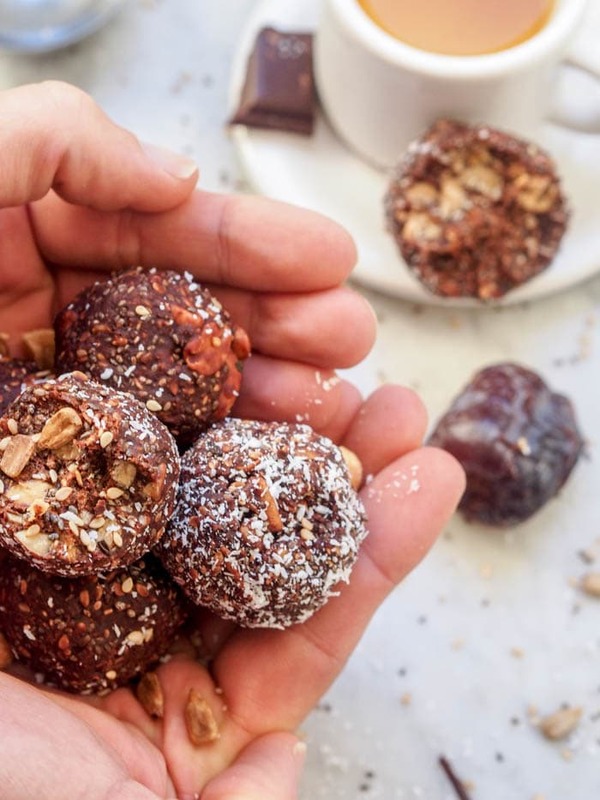 No refined sugar – just dates and pure dark chocolate to sweeten these babies. No ordinary table sugar needed. And there’s plenty of crunch in each chocolate coconut balls thanks to all the nuts and seeds. For nuts and seeds I added chia seeds, sunflower seeds, sesame seeds and peanuts. Lots of great crunch and a strong texture. And yes oh so healthy at the same time. Chia seeds are my new favorite superfood and I like to sneak them into everything I make (yes breakfast, chocolate oatmeal is a fabulous place for them too!). 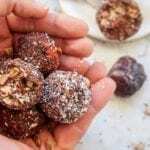 In this vegan chocolate balls recipe everything gets added to one pot, with the dates being finely chopped into a paste. Then mix everything together well, making sure you don’t just end up with half balls of date paste, you don’t want that. But the pot on the stove for literally a minute, just so that the chocolate melts and mix everyone again. Pop into the freezer for a moment to help the mix form together into balls more easily. Form into 6-8 balls, pop back into the freezer to harden, and while you’re licking the chocolate off your fingers these will be good to go. Chocolately and nutty at the same time with an awesome coconutty flavor. Dip into extra shredded coconut for an even stronger coconut flavor. These vegan chocolate balls with shredded coconut make for a perfect guilt free summer no bake one pot dessert. Barely any effort required! 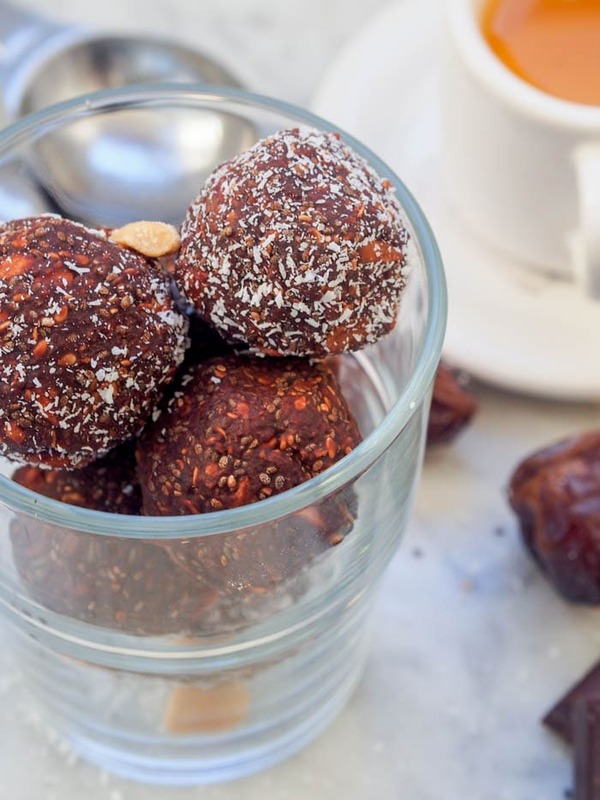 For more vegan dessert ball recipes check out my vegan peanut date energy bites, vegan hazelnut truffles with coconut and figs, and vegan energy balls with chocolate. In a pot combine dates, peanuts, shredded coconut, chia seeds, sesame seeds, sunflower seeds. Mix. Add 1/2 cup chopped dark chocolate. Melt over low heat mixing everything together until chocolate is melted. Remove from heat and place pot in the freeze for a few minutes. Form 6-8 balls from the mix. Optional - toss balls with additional shredded coconut. Hi. Do you have an alternative for the dates and coconut as my daughter doesn’t like either. Thank you! 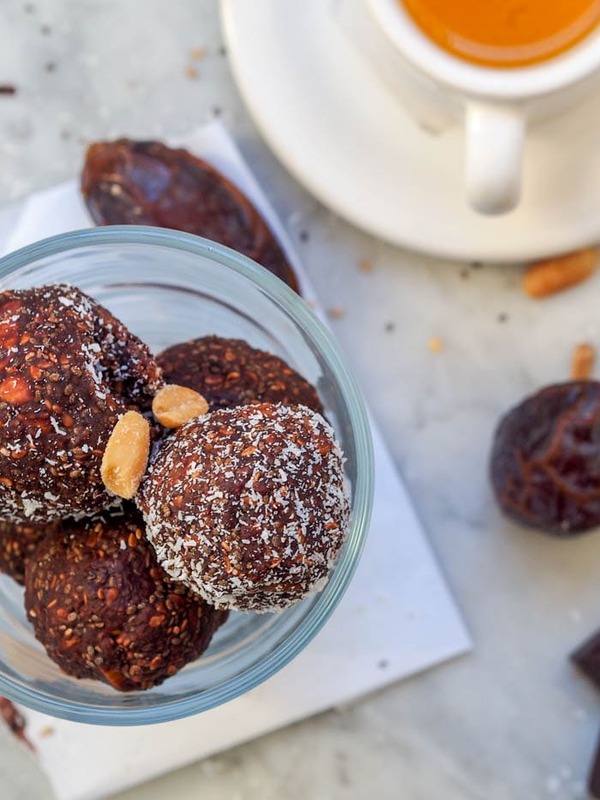 Instead of dates you could use figs, or maple syrup, but I honestly do not taste the dates in these balls, I simply add them for the natural sugar. The coconut you can omit and replace with a bit of cacao powder. Hope that helps! Wow, I can’t believe these only take 5 minutes and amazingly guilt free! I love dates! I will definitely give these a try! Would be a much better snack than those cookies that come into the office! These look absolutely delicious! I could snack on these all day! These look like the perfect snack bite that doesn’t take you down the sugar-bomb road! I’m always playing the “bad cop” to my husband’s indulgent “good cop” – Glad to know I’m not the only one! Yes! That’s exactly what these are! I like your maple syrup suggestion because I’m not a date fan. Love that these are no bake. Thanks! Yes I think maple syrup should work instead! So happy you enjoyed my recipe! Thanks for taking the time to comment and let me know! : )) To help them stick together you could add in a little bit of coconut oil. Or try throwing them in the freezer for a few minutes to have the mixture harden a little bit before trying to form them.